Gone are the days when half a grapefruit for breakfast meant boring diet food. A light honey glaze and a quick cook under the broiler takes this simple, healthy morning meal to the next level! 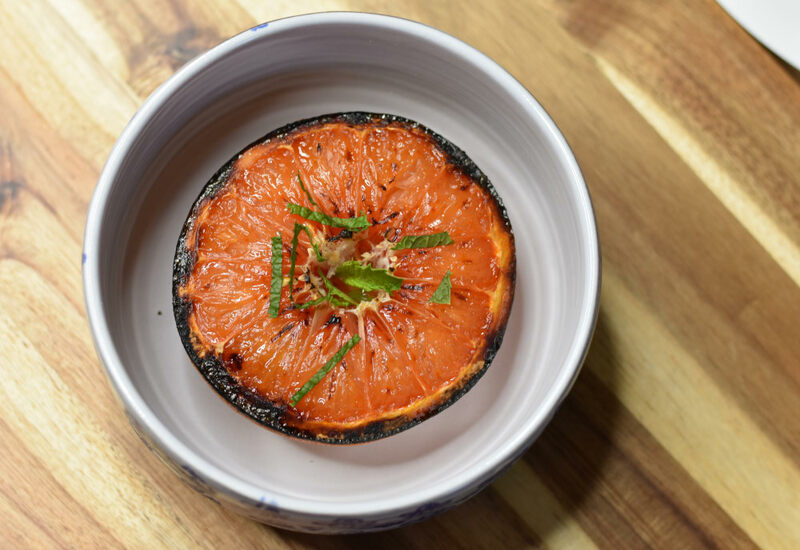 Broiling the grapefruit adds a slightly smoky flavor as well as a caramelized sweetness—so much better than just sprinkling with sugar. Serve with a little bit of chopped mint for a refreshing contrast to the bittersweet fruit. You could even make this as a healthy dessert! Add a little more honey as desired, and serve with barely sweetened whipped cream. While the caramelized grapefruit already accommodates many dietary restrictions, such as gluten-free and low carb, you can substitute agave nectar for the honey to make it vegan. For a different flavor, try switching out the honey and mint for brown sugar and chopped basil! Per Serving: 78 calories; 0g fat; 19.9g carbohydrates; 1g protein; 0mg cholesterol; 4mg sodium. So I already am a huge fan of grapefruit in the mornings. However, how can you make it better? By baking it duh! I don't have much of a sweet tooth so this fulfills my sweet cravings definitely in a healthy way! Woah, this is such a cool new way to prepare grapefruit. Still incredibly healthy, but made into a decadent treat with just that 1 teaspoon of honey per grapefruit half. Can't wait to serve this to my next houseguests! I love grapefruit and eat it weekly. This was a runway to shake things up a bit but still get my daily grapefruit fix. Very delicious and easy! When I think of splurging on a decadent breakfast it's not usually grapefruit that comes to mind. Now it does. The broiling plus just a little honey really cuts the bitterness of the fruit and then the mint takes it home with a refreshing round-out to the flavors. This is a completely new grapefruit experience that will keep you coming back. Grapefruit will no longer be pushed to the sidelines of my breakfast; it's now a headliner!